(WACO) – The driver of the semi-trailer truck made the turn onto Airline Drive and maneuvered left into a driveway next to Texas State Technical College’s Building Construction Technology building. A BCT faculty member sat ready with a forklift to begin unloading the vehicle’s contents. And, the items kept coming and coming. The semi-trailer truck carried more than 1,300 pieces of lumber from Boise Cascade in Sugar Land and 80 pieces of No. 2 and BTR (better) Douglas fir lumber from Weyerhaeuser Co. in Houston. 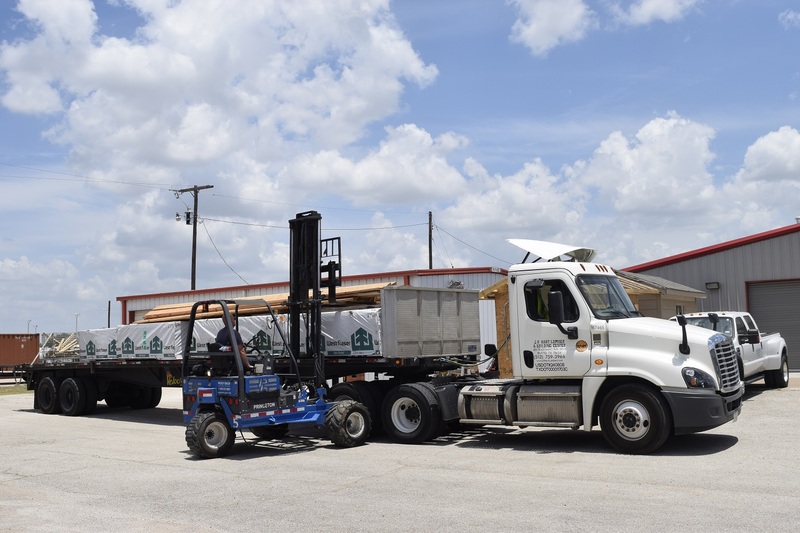 The items were delivered by Double G Forest Products in Navasota. The nine bundles of lumber is valued at slightly less than $14,000. The in-kind gift was from Camden Living in Houston and organized by Steve Hefner, senior vice president of construction and a graduate of the BCT program at TSTC in Waco. “I’m a huge advocate of TSTC and I believe strongly in our workforce and technical schools that provide a benefit to this country,” he said. Michael Carrillo, a TSTC Building Construction Technology instructor, said the gift means he and other instructors can have students work on larger scale hands-on projects in classes. Hefner also made a $2,500 gift to the Building Construction Technology program for SkillsUSA. SkillsUSA is a nationwide professional organization teaching technical, academic and employability skills that help college and high school students pursue successful careers. TSTC’s Building Construction Technology program has students that participate in cabinet making, carpentry, plumbing, electrical and group construction contests on the state and national level. “These will be life changing moments for the students in the future,” Hefner said. Carrillo said the money could be used to purchase uniforms and hard hats for the program’s SkillsUSA participants to use at yearly competitions and scholarship opportunities for future students. Porter said he hoped the construction students would value the gifts. And, he said he wants one day for the students to contribute in their own ways to the program long after graduating. “I hope they do see there are good people in the world who really want to help a good program,” he said. This entry was posted in Waco on June 29, 2018 by Daniel Perry.